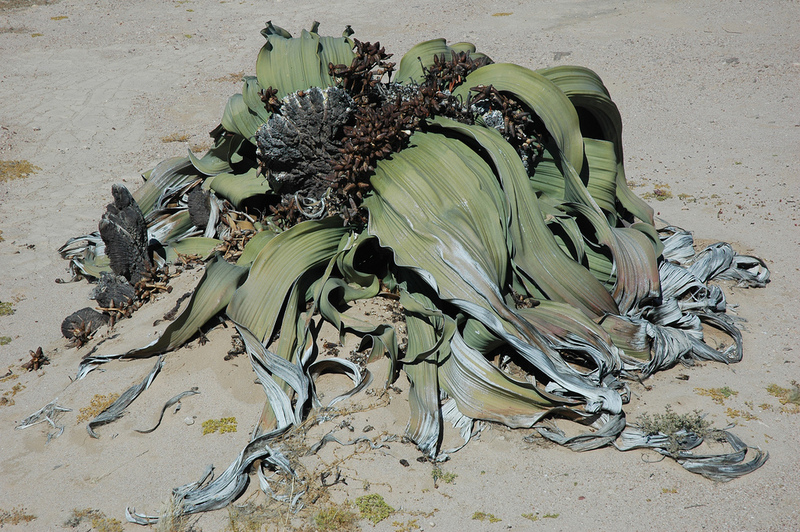 Were you to come across the Tree Tumbo (Welwitschia mirabilis) you may well think it's on its way out, staggering on its last legs, wilting on its last leaves, altogether about to die. This wouldn't be surprising since it is only found in the Namib Desert along the coast of south-west Africa. Round these parts average annual rainfall is a paltry 25 millimetres (1 inch) with temperatures reaching 40°C (about 100°F). You would be wrong, though. 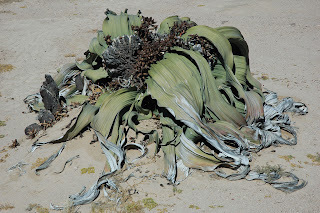 Strangely enough, what looks like a mass of desiccated vegetation wiping its feet on the doormat of death is actually an example of life thriving in an extraordinary manner in an extraordinary place. The tree tumbo is a bit like a carrot really, with a huge taproot that stores moisture and a root system that can extend 30 metres underground. This seeks out deep moisture and anchors the plant against the powerful winds of the Namib. Looking up, we see the tree tumbo's stem, which can help make a large specimen some 1.5 metres tall. If you thought the tree tumbo was on its last leaves you would be right in the sense that it only ever has two of them, the same two it had at its beginning, the longest lived leaves of any plant in the world. They grow continually through the plant's life, are little more than a millimetre thick and are used to absorb moisture from the air for taproot storage. The coast of the Namib gets some 50 millimetres (2 inches) worth of rainfall via fog each year, so if you want water, this is how you have to get it. It's interesting to point out that most plants take up water from the roots and either store it or pass it out through the leaves. The tree tumbo goes the other way entirely, absorbing water through the leaves and passing it down into the taproot. The leaves are actually half dead, becoming dry and brown as you get to the tips, but they reach some 4 metres in length or even longer. They also get shredded and torn apart in the aforementioned Namib winds, but none of this seems to be a problem for the tree tumbo. That mass of dry vegetation could well outlive you or I. They typically live for several centuries, sometimes over 1,000 years and some have been estimated to be over 2,000 years old! It is also regarded a living fossil, so it really seems to be doing alright for itself. Tree tumbos are all either male or female, and produce cones. They are thus regarded as gymnosperms, like conifers. But the male cones also produce flowers, like angiosperms, with nectar that attracts insects. It is thought that the chief pollinator is a wasp. Females can then produce thousands of seed that are dispersed on the wind, almost all of which are eaten or killed by fungus. However, the seeds can lie dormant, awaiting the Namib's version of a rainy year. They can then sprout and begin growing the leaves of a lifetime and secure desert oddity for the next millennium and beyond.